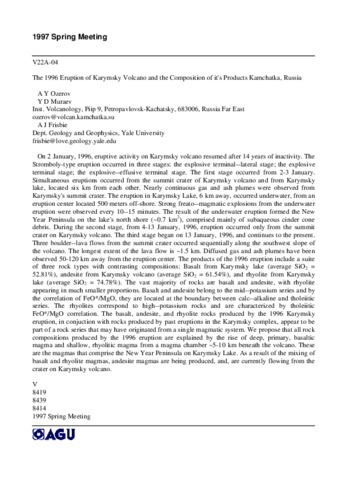 Ozerov A.Yu., Konov A.S. Regularities in the dynamics of the Klyuchevskoy volcano eruptions // Proceeding Kagoshima International Conference on Volcanoes. Japan: 1988. 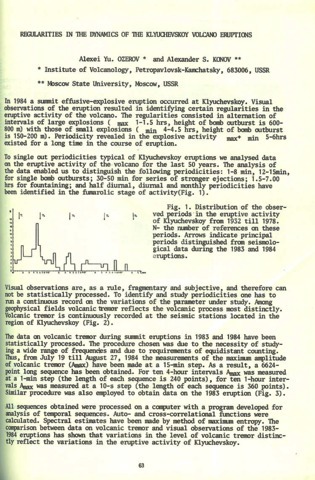 P. 63-65. Ozerov A.Yu., Murav’ev Ya.D., Frisbie A.J. 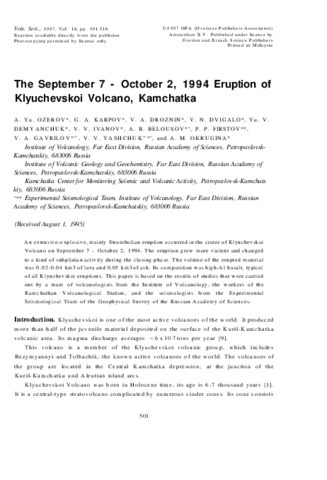 The 1996 Eruption of Karymsky Volcano and the Composition of its Products, Kamchatka, Russia // AGU Spring Meeting 1997 Abstracts. Baltimore, Maryland: AGU. 1997. P. V22A-04. 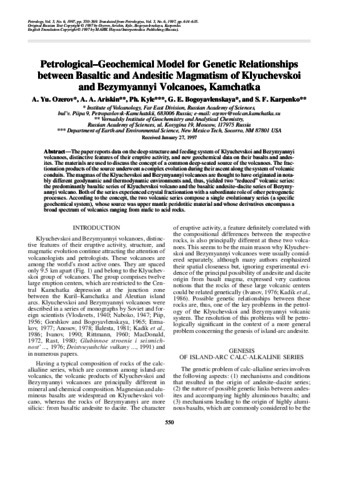 The origin of calc-alkaline high-alumina basalts (HAB) of the Klyuchevskoy volcano, Kamchatka, was examined using electron microprobe analyses of phenocrysts and mineral phases included in the phenocrysts. 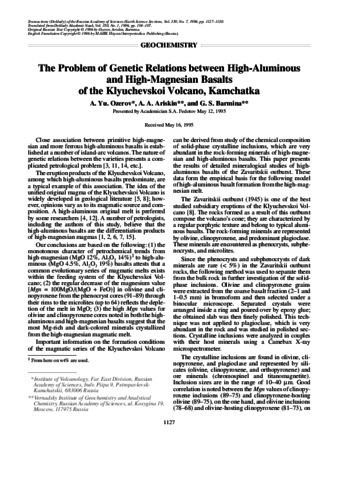 Continuous trends on major-element variation diagrams suggest the HAB were derived from high-magnesia basalt (HMB) by fractional crystallization. Phenocrysts in the HAB are strongly zoned: olivine (Mg# 91–64), clinopyroxene (Wo45–38En40–51Fs5–20) and chrome—spinel/magnetite inclusions in them (Cr2O3 45–0 wt.%, TiO2 0.5–11%). 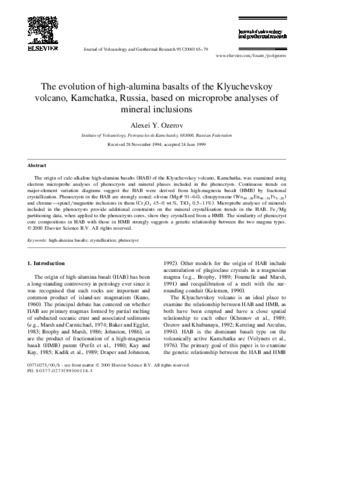 Microprobe analyses of minerals included in the phenocrysts provide additional constraints on the mineral crystallization trends in the HAB. 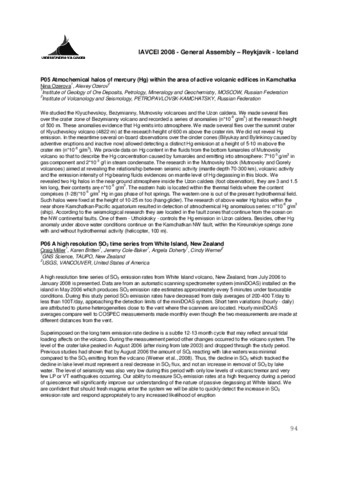 Fe/Mg partitioning data, when applied to the phenocrysts cores, show they crystallized from a HMB. 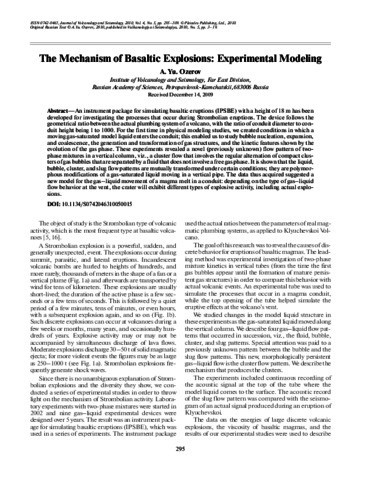 The similarity of phenocryst core compositions in HAB with those in HMB strongly suggests a genetic relationship between the two magma types.